In Motion is an art installation and series of performances on the Yerevan-Gyumri train, that will last for 4 days: from Thursday, October 29 until Sunday, November 1. When and where can we see the art installation? Our art installation is set up in two wagons of train A, and one wagon of train B. There is no art installation in train C.
You can see the installation from Thursday, October 29, to Sunday, November 1. What is the HAYP train schedule? The train will be running its normal schedule during HAYP’s In Motion exhibit. 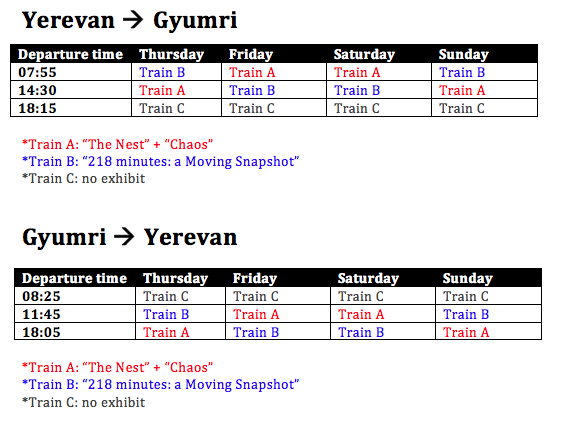 Every day, the train goes from Yerevan to Gyumri at 7:55, 14:30 and 18:15, and from Gyumri to Yerevan at 8:25, 11:45 and 18:05. How much does a one way train ticket cost? 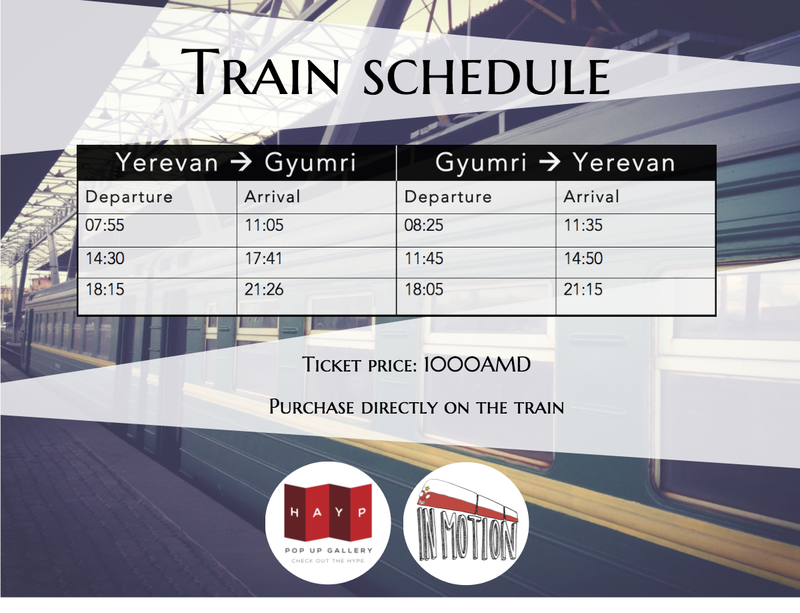 Train tickets from Yerevan to Gyumri and vice versa are 1000AMD. You can buy your tickets directly on the train, or at the station. Reservations are not needed. Cash Only. What events are happening in Gyumri during In Motion? 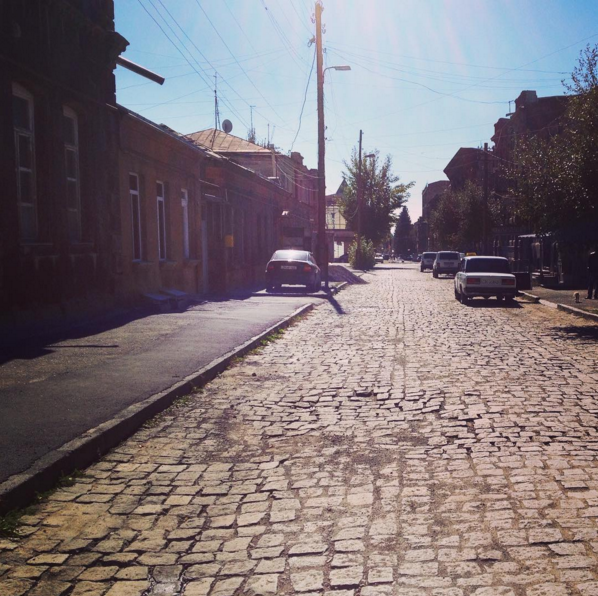 We encourage our HAYP passengers to stay overnight in Gyumri to make the most out of their journey! What else can I do in Gyumri? There are also many museums and historical buildings to visit in Gyumri… and several restaurants that serve delicious food. Our train passengers will be given a “What to do in Gyumri” brochure upon boarding the train! 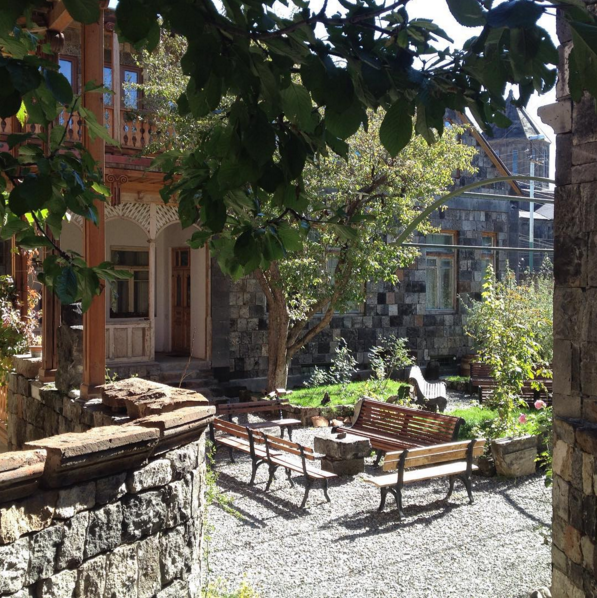 If you want to stay overnight in Gyumri, we recommend staying at Villa Kars or at Berlin Art Hotel. Both places are stunning and unique creative experiences, and offer discount rates for “In Motion” participants. Another option is KASA Foundation youth hostel. Call them directly to reserve a room! Are the events free? Do I need reservations? Most events are free and do not require reservation beforehand. Free events: Luys i luso performance on Thursday, Friday and Saturday. Gallery 25 exhibition on Thursday. The concert at Gyumri Jazz Club on Friday night is 1000AMD. Tickets are available at the door, but if you are planning on attending with a large group, reservations for tables can be made by calling 055 280280. When can I see performances in the train? Theater, contemporary dance, acoustic guitar, accordeon, latin american folk music… For the detailed program, click here.